All of you might be watching the ICC world Cup 2015. But have you ever thought of some great technologies used in this tournament? Yes, it is fully an automated system which is controlling the whole match events. Read this article and know about the top 5 new technologies used in ICC World Cup 2015. ICC World Cup 2015 has started and it is obvious that there will be a lots of new stuff yet to come in this tournament. The performance of the teams will lead them to their destiny. There are about 16 teams participating in this tournament and it is really a great challenge to the organizers to manage such a big tournament at international level. You might have seen the earlier tournaments and matches which were managed manually by the humans without full use of the technology resulting in some unfair decisions, mistakes in the scores, slow counting of score etc. But in 2015 Word Cup we have seen a lot of new stuff in the field of technology which has been implemented to carry out each and every aspect of the matches very well. Below are some of the top modern day technologies which are being used in ICC World Cup 2015. Snicko is the high definitions audio-metric device which can measure the sound starting from the frequency of 0.1 Hz which is that much of sound which even when given through an ordinary loudspeaker cannot be heard by a human ear. So, one can imagine the quality of this device. In ICC World Cup 2015, it is being used to recognize the sound produced due to contact of ball with the bat of batsmen. Even a negligible nick can be given preference in deciding the fate of the player whether he has to remain in the field or declared 'out'. The measure of the sound can be taken from the graph developed by it. This device needs to be kept close to the area of contact of bat and ball. So, it is fitted behind the stumps to catch the best possible sound frequencies. In ICC World Cup 2015 beginning matches, we went through a new implementation i.e. the spots where the bowlers drop their balls are being highlighted just like an infrared graph which measures the degree of hotness of an area and gives the color accordingly. You might have observed, when this graph is displayed, it reveals some blue spots on the pitch indicating the area of contact of bat and ball. Thus, darker the color is, the more balls have been placed there. This graphs shows the bowling strategy of a bowler against a particular batsman or the whole team. It can be used by the players during practice sessions to understand the strategy of a particular bowler. You might have seen in the recent matches and the matches of ICC World Cup 2015 that the stump bails when whipped off start glowing red which indicates their detachment from the wickets. Earlier, the fall of bails completely on the ground was considered to be the time of ball-stump contact which lead to unfair decisions but now the lightening bails have shortened the distance by a great margin i.e. 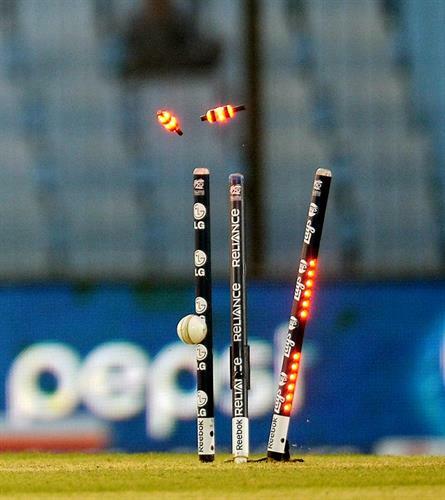 they start glowing when they are just 5mm displaced from their set position and hence giving the Umpires the best results. Yes, the flying camera! You might have observed something moving above the heads of the player just like a mini helicopter. It is not a helicopter! It is a camera, yes a camera! It is controlled by an expert via a joystick just like a remote control helicopter. This device is used to keep watch on the match details minutely. It is used to take close ups of the players and also helps to view the events of the match in different angles. 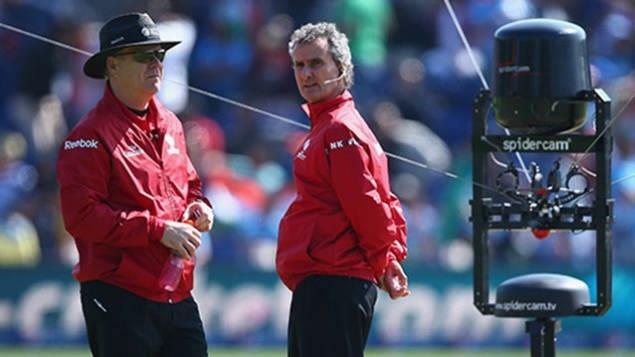 Specially, it is used by the 3rd Umpires to closely look into the calls transferred to them so that they could make a fair decision about which the field Umpires usually are not sure. So, this is really an effective technology of the modern world used in the field of cricket. I used the smartphone app i.e. the official app of ICC for getting the live score in the 2011 World Cup and as well as in 2015 but found that the score is being more quickly updated than before, just in case of a television. After inquiring about the reasons I found that ICC, this year, has connected the app server with the TV servers and hence the score updates as quickly as on a TV. This is really a great change made by ICC in 2015 World Cup and is very helpful to those which are not able to watch the live matches in the Stadium or on the TV. So, I must say, WOW ICC! Thanks a lot for this feature. This was the information about the latest technologies used in ICC World Cup 2015. The implementation of such technology really unloaded a lot of responsibilities from the shoulders of the organizers. The manual work has now been handed over to the automated system to ensure fair decisions and correct statistics of the matches to be played in ICC World Cup 2015. If you want answer to any of your queries related to this article, feel free to contact me in the form of response to this post. I will feel myself lucky to help you get the solutions of your problems. The game has turned more interesting with these special technological advancements. Also it has brought unambiguity in the decisions. This must have relieved the umpires the most because they now can perform their duties more confidently.